2015 is off to a great start for UFO finishers! 18 finishes this month. In case you're new to 52 Quilts here is the link to the post explaining the UFO Challenge. 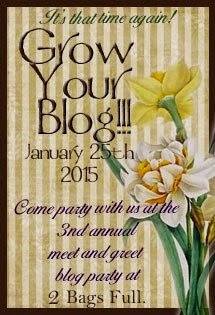 And if you haven't yet commented on the Grow Your Blog giveaway, here is the link to the post where you should comment for a chance to win. Nancy sent her photos early in the month -- and she has so many finishes, I decided I should show you just the "stack" of finishes she submitted, then I hope you'll visit her blog, "My Love of Fabric, here, to see all her 2014 finishes. Donna gets the nod this month for "oldest UFO."
. . . it is actually 30 years in the making. 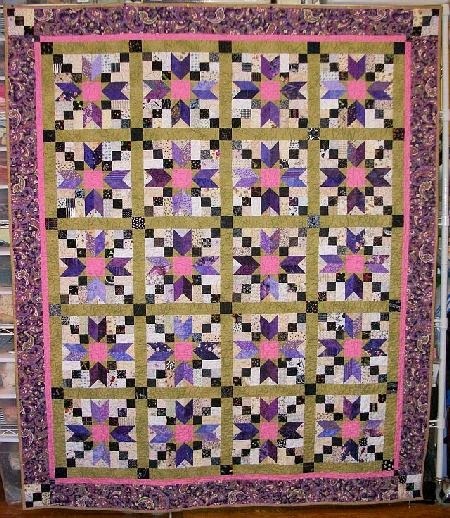 About 30 years ago a friend and I took a class to make a Martha McCloskey feathered star quilt using the quilt as you go method. There were problems and we wound up only completing two blocks. 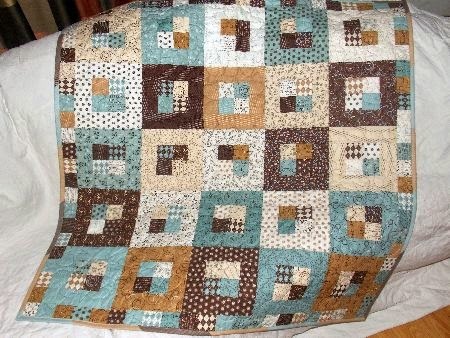 I started to work on it a few years ago but could not find the original fabric and because it was quilt as you go, the two blocks had sashing on only two sides. 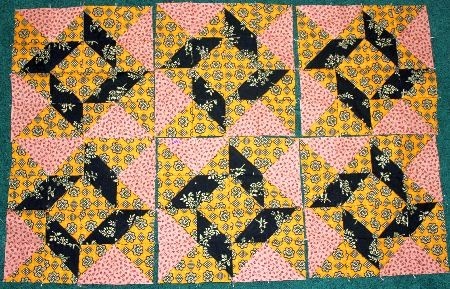 I couldn't figure out how to complete the quilt the way it was originally supposed to be, the fabric was, of course, no longer available, and I didn't want to cut them up like my friend had done with hers when she used them to make stockings. The obvious choice might have been to turn them into throw pillows but I was afraid they would look weird with the sashing only on two sides. Then last week it finally came to me ... 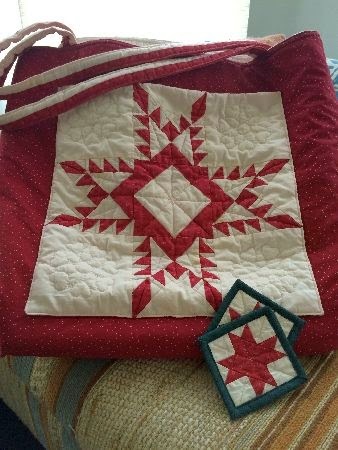 I could use the main part of the block for pockets on a large tote bag, the sashing for the straps, and the corner stars are now coasters. A 30 year old project is finally finished! Clever use of a UFO, Donna! 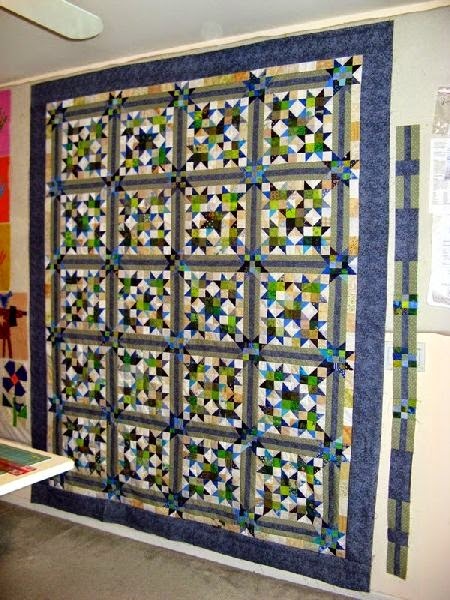 Martha-in-Idaho has a lovely finish of a jelly roll quilt called "Me Oh My." Love these colors, Martha! 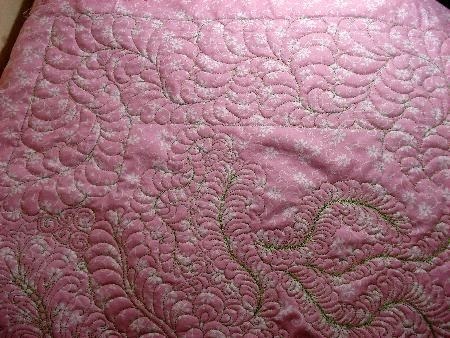 Here is a close-up of the quilting and Susie's Magic Binding! 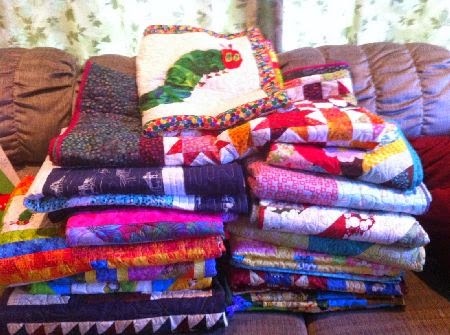 I love that Martha is sending the quilt to a friend in Oklahoma who gave up a successful career to become a professional Santa Claus and started a non profit Santa Claus organization. 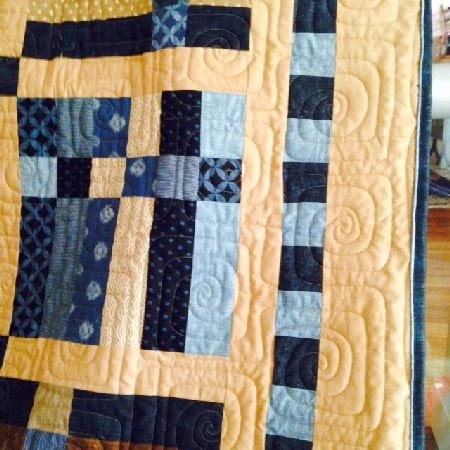 Pamela made this quilt completely on her treadle sewing machine. Be sure to go to her blog, Pamela Avara Arts, here, to read the back story. Mary used one of my all-time favorite fabric collections for this cute finish. Be sure to stop by Zippy Quilts, here, to see another finish! 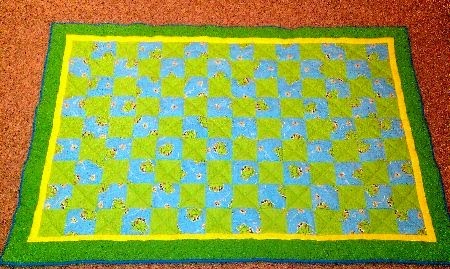 Jill started this baby quilt when her grandson was "on the way." He will turn 5 this year -- oh, well, as she says, it can be saved for the next baby! 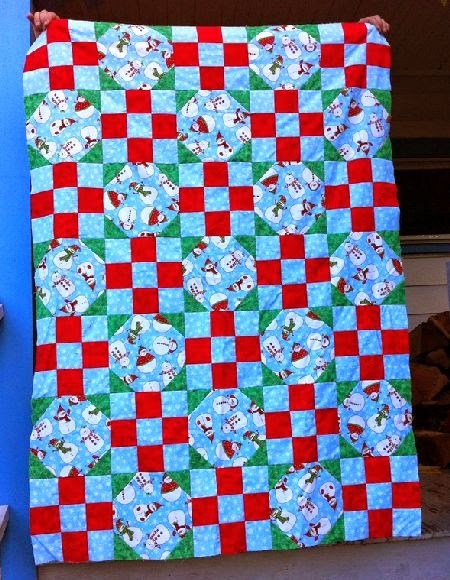 Be sure to click on the photo so you can see the great quilting job her long-armer did! I always love seeing what "K" name Sandi gives her kwilts. Here is "Kool Krystals," a Bonnie Hunter design originally named "Scrap Crystals." It's a big one, finishing at 75" X 90"! Visit Sandi's blog, KwiltnKats, here, to read the rest of the story. 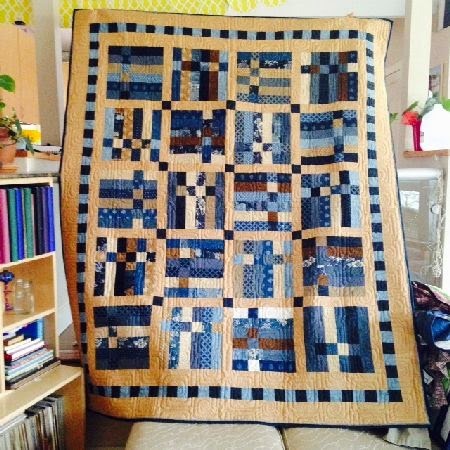 Oh, look, Pam has a second finish -- and a second Bonnie Hunter quilt! Here is Pam's take on "Jared Takes a Wife." Pam made this quilt for her sister-in-law's birthday, finishing it two and a half weeks before SIL's birthday! Here is the link to Pamela Avara Arts and the whole story. 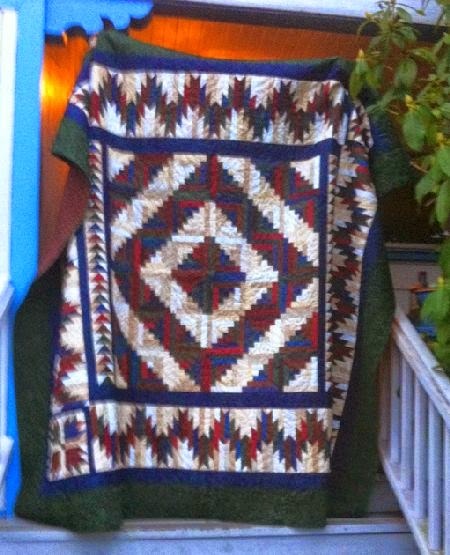 Sue finished a "whole cloth" quilt while practicing feathers. 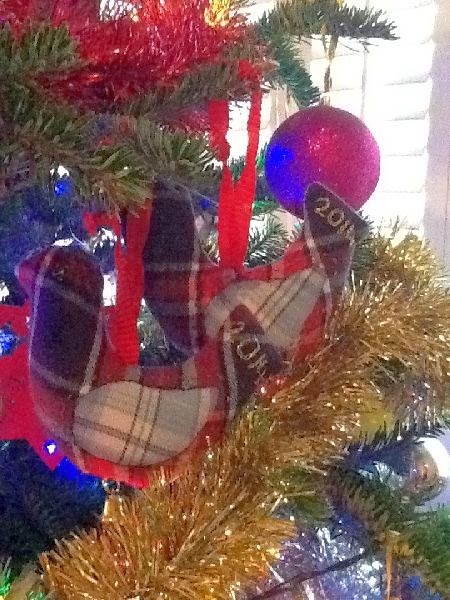 Be sure to visit Sue's Quilty Bits and Bobs, here, for better photos! I love that idea, Gill, wish I'd thought of that back when my boys were shorter than me! Nancy has two finishes for January, and "oldie" and her #2 UFO. First, a Bear Mountain Log Cabin. The pieces are small and lots of them. 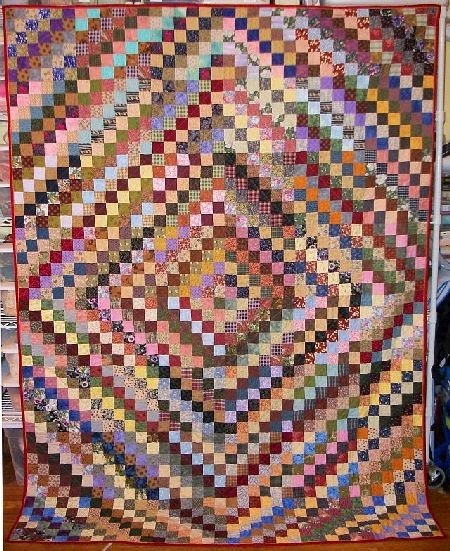 I completed the top years ago, I think six, but just got it quilted this fall. 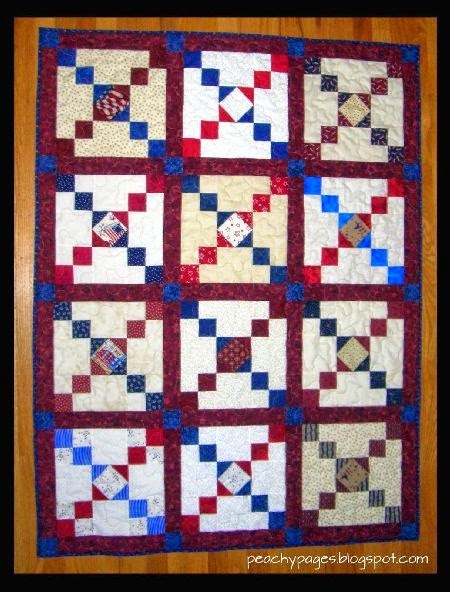 And second, an old one, a lap quilt made of flannel. snowballs and 9-patches. Snowball and 9 patch. Oh, here is the secret to Nancy's prolific finishes! "I have the top made and made the back. 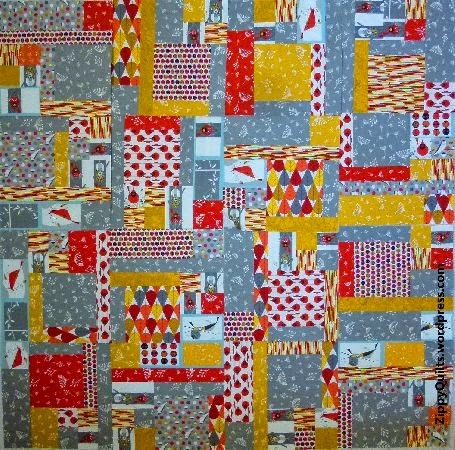 It has now gone off to my daughter the quilter." More quilts and more stories at Nancy's blog, "My Love of Fabric," here. Heather is using the UFO Challenge to finish her Civil War Melodies BOM from two years ago. Good idea, Heather! Heather blogs at "A Reformed Heath'n", here. Heather-at-PeachyPages donated both of these quilts to the Wounded Warrior project at Ft. Leonard Wood, in Missouri. 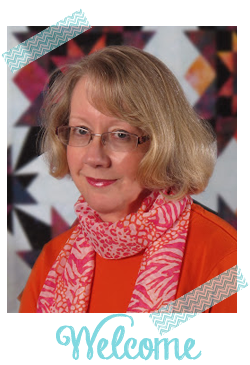 This Heather blogs at Peachy Pages and tells the story of her Wounder Warrior quilts here. Donna (a different Donna from above!) received a new sewing machine from her DH for Christmas! So she is ready to crank out the UFOs -- thank you, Donna's husband! 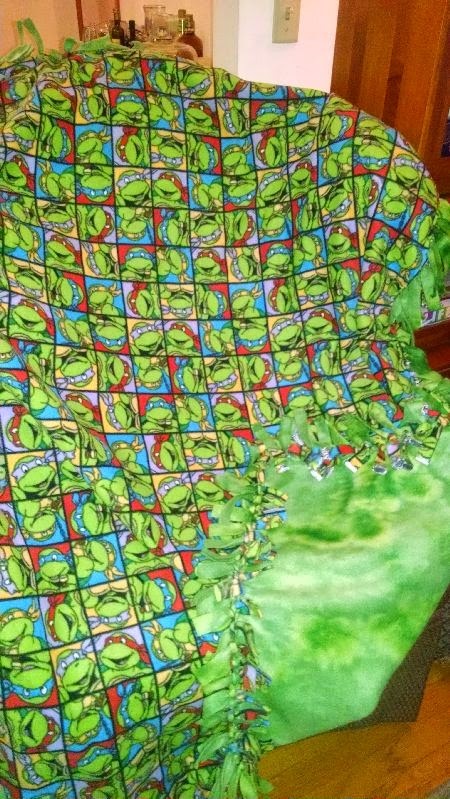 Donna made this Ninja throw for her grandson, who sleeps with it and takes it to daycare. A lovey! This Minky "lovey" has gone to live in England. Isn't the binding finish cute? 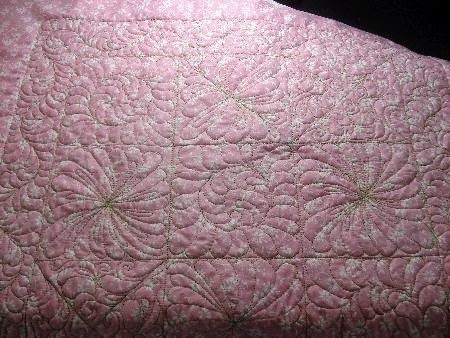 Here is Donna's first quilt "quilted" using her new machine, and the story behind it. 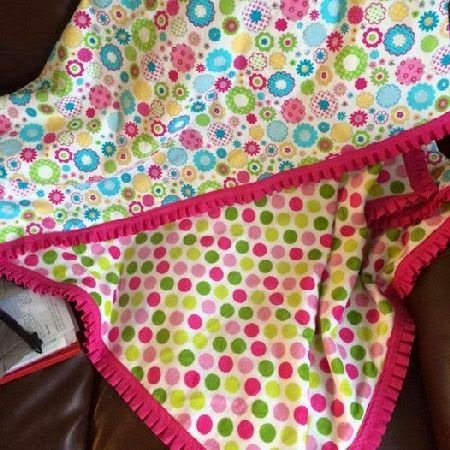 "My husband got me an incredible sewing machine for a present for Christmas. 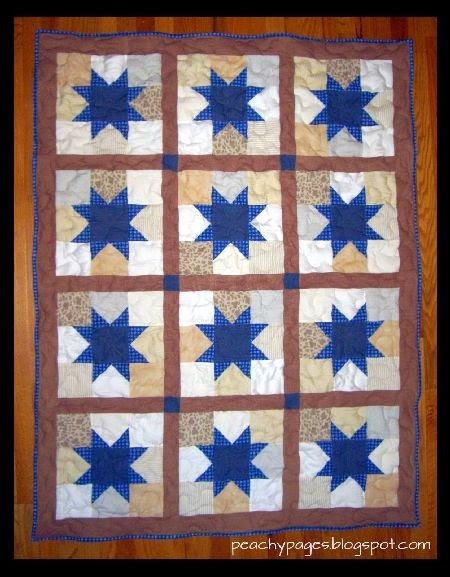 This is the first quilting project I did on it. I took a Craftsy class on quilting with your walking foot and the spiral echo quilting seemed to be perfect to suggest the sun setting into the water as the quilt design was sunset over water, I think. From Quiltmaker." 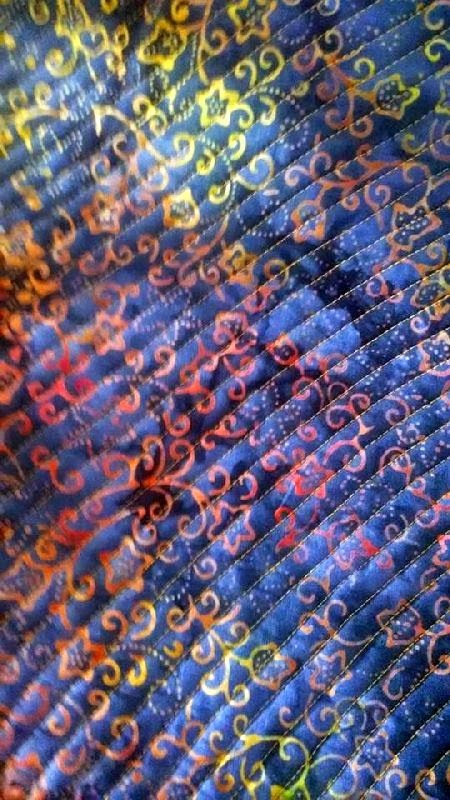 And here is a detail of the quilting, seen from the back. Donna reports this quilt needs to be "steamed into submission" as it is not lying flat. 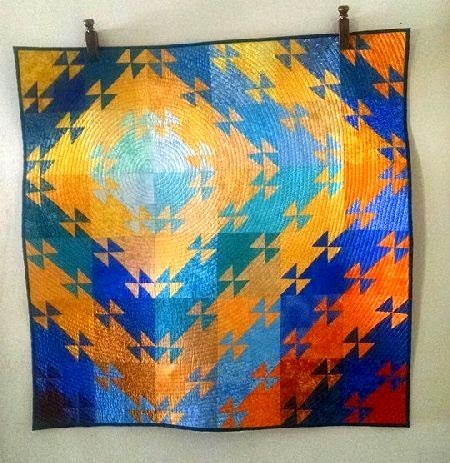 Donna, you inspire me to do a tutorial on blocking quilts! Wish you lived closer so I could use your quilt as the model. Becky finished this cutie for a charity quilt. The colors are so bright, my computer had a hard time deciding where to focus on the photo! It's nothing elaborate, but at least this little quilt gets me back on the UFO bandwagon. The frog fabric was left over from making pajamas and I bought flannel over a year ago to turn the scraps into a "quick" charity quilt. So much for the quick part, but at least it is a finished quilt now! Wow, so many finishes, I count 18! I hope I didn't miss anyone, but if I did, please let me know and I'll update the post. Mr. Random Number Generator chose Donna-of-the-Feather-Star as the winner of this month's giveaway. Donna, if you'll email me your postal address, I'll pop your prize in the mail. Keep up the good work, everyone! Oh, and my own UFO? So many great finishes this month! It made a wonderful parade of finishes. I still have my hand-cranked sewing machine, but I no longer use it. I am off to find out why Pamela still uses her antique! Wow, what a busy group we've all been. Hope we can keep the ball rolling all year long! 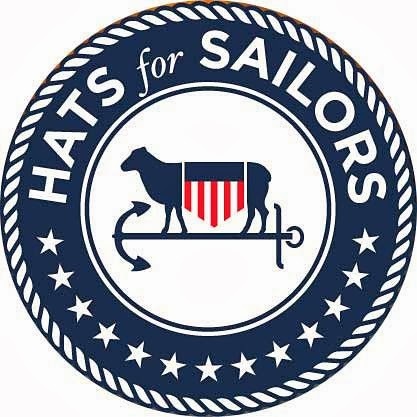 Way to go everyone, and thank you for the great Show n Share, Marti. Donna gives me hope I'll get my oldest done. Lots of great finishes, well done everyone. An almost finish here, just need to sew the binding on my little Lynette Anderson quilt. Still plodding along with the huge hand-pieced Irish chain! Wonderful fnishes everyone...too hard to pick a favourite this time.